The TBX is a truly portable HF transmitter/receiver. The receiver can be powered by batteries, dynamotor, or rectifier, and the transmitter can be operated by a hand-cranked generator, a gasoline engine generator, motor-generator, or a dynamotor. It puts out 9 watts on CW or 3 watts on AM from a one tube transmitter based on an 837 pentode, crystal or master-oscillator controlled. As a field portable set, it was carried by four men. One carried the radio, one the battery and accessory box, one the generator, and one the antenna. The battery and accessory box carried the receiver batteries, headset, microphone, and key, receiver cable, and spare tubes. The antenna is a 24-foot guyed whip. A portion of the whip can be used with a wire extension as the "long antenna". In the field I run my TBX receiver with an inverter or dynamotor, and the transmitter with the hand-crank generator or gas generator. At home I use the rectifier power supply to run the receiver, and a motor-generator to run the transmitter. I drive the generator unit from the gas generator with a 1/4 horsepower electric motor. Shown above is my TBX-4 as I run it at home. 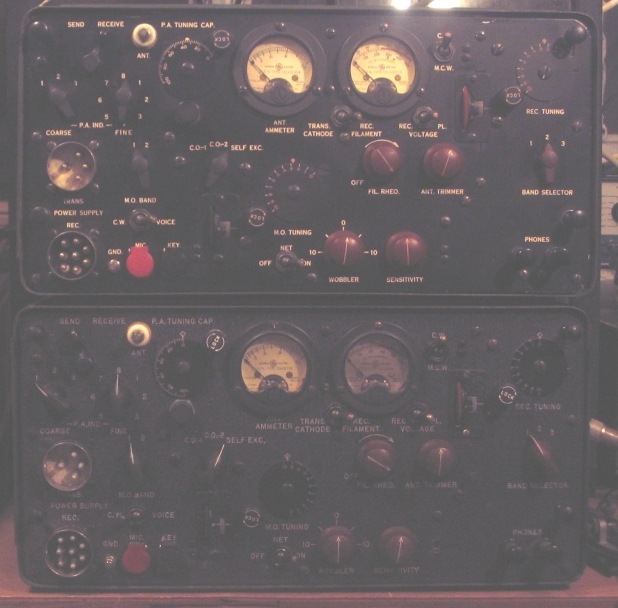 Rectifier power supply(for receiver) to left of the transceiver, motor-generator above, original mic, headphones in front. I don't usually use the headphones as the rubber muffs are rather fragile. The key is a standard CJB(Bunnel)-26001 type on a round base that locks onto the top of the cabinet. The key pictured is missing the rubber cover that covers the entire key, even the adjustment knobs. The coolest part of this particular key is that it was brought home as a souvenir from the Okinawa campaign by PFC Joe Rapp, USMC radio operator. On top of the rectifier power supply is an LM frequency meter which is a handy accesory to the TBX, especially when trying to contact modern amateur stations with selective receivers. Spotting the transmitter on the receiver frequency is quite hard with the TBX alone, as the strong transmitter signal pulls the receiver. The LM produces a small signal that can be zero-beated with the received signal. Then, listening to the LM audio, the transmitter signal is beated with the LM's. The TBX-4, CGQ-43005-A, pictured above is made by Garod Radio Corporation under a contract with Hazeltine Electronics Corporation. Below is a TBX-6, CG-43005-C, made by General Electric. I am still studying the differences between these, but they seem to be few and superficial. The TBX-8 is quite different, with a higher upper frequency limit on transmit, and a totally different front panel layout. My TBX-4 has a semi-gloss finish on the front panel and the radioactive paint on some of the dials and controls. The TBX-6 has a black wrinkle finish and no radioactive paint. Both bear crystals for 2716 and 3155 kc. In the field, one of the four-man crew carried this hand-cranked generator for the TBX transmitter. It produces 12V DC for the 837 filament and for microphone power, and 500V for 837 B+. It attaches with a chain around whatever you have at hand, even just a short log. A 25-foot cable connects it to the transmitter. On April 9, 2005 a coast watching exercise was held at Buzzards Bay, MA in preparation for the passage of the LST-325 in early June. Organized by Dale Gagnon, KW1I, a network of 5 stations was planned, and four participated, with one lost to contingency. The net control station was KW1I at Massachusetts Maritime Academy, aided by Larry N1PHV. The LST is due to dock there on its east coast cruise. 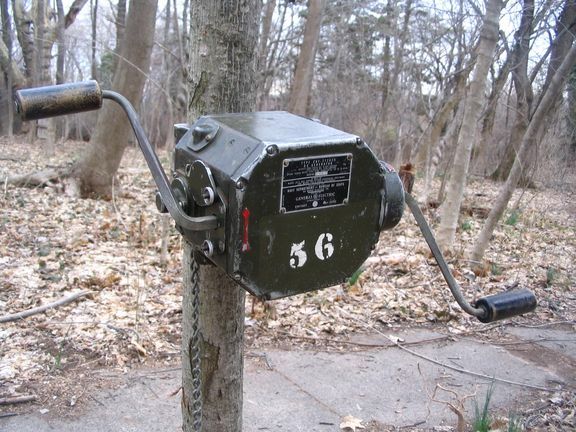 Other stations were W1NZR/W2ILA on Gooseberry Neck, KA1GON and his friend Van on Gunning Point Beach near West Falmouth, and K2WI/N1SNG on West Island in Fairhaven. Gunning Point and West Island are right across from each other in the middle of the Bay, and separated by 9 miles. The other stations were about 15 miles in each direction from there. 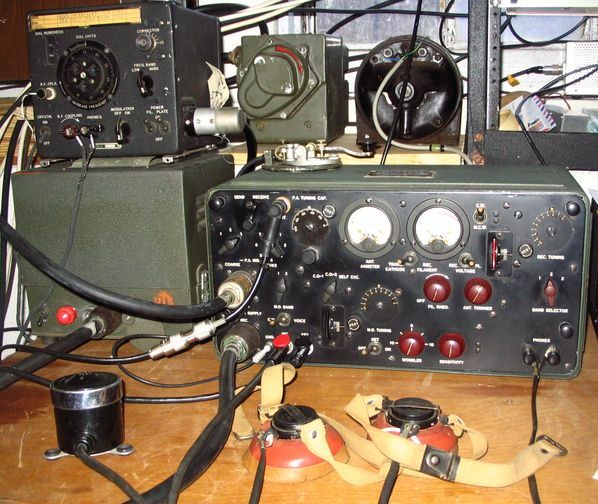 The K2WI team had little idea of what to expect, as their TBX set had only been used on skywave communications with the typical results on the Old Military Radio Net being, "All stations 5/5 except K2WI who is weak." NAVSHIPS 275 says of the TBX, "These equipments are intended for ship and shore communication purposes between similar equipments and other units of the Navy Communication System at ranges of approximately 30 miles for A1 transmission and 15 miles for A3 transmission." While our operation was within the range indicated, I did not know how hard the operators were expected to work at maximum range. We had in our favor that most of the paths were 100 percent over water. With Glenn, N1SNG's help, the TBX-4 and EF-8 gasoline-powered generator (hand cranking is tough on the tennis elbow) were hauled 150 yards to the beach and deployed in less than an hour. One 30-foot and one 60-foot counterpoise were deployed. Having loaded a wire model at the K2WI home QTH, the approximate loading settings for the 7-section, 24-foot vertical had already been determined and were found to agree. The TBX receiver was powered by an inverter made out of a GE mobile rig by Ray KA3EKH. Upon deployment, 3885kc was monitored with the usual crowd coming in. We were quite early so we had a lot of time to anticipate the start of the net. Two sets of headphones allowed Glenn and I to both listen in on the action. After a long wait, we were blown away when we heard "KW1I testing" at ear-splitting volume. The TBX provides this kind of experience as it has no AVC. We established contact with Dale and then tried to move off of 3885 to avoid QRM, at which point we lost him. After re-establishing contact on 3885, we successfully moved down to 3875, and W1NZR checked in from Gooseberry Neck. Initial contacts with both KW1I and W1NZR were made with each using GRC-19 sets, but both switched to GRC-9s, which are quite similar to the TBX in capability. Contacts were solid from the ends into the middle of the Bay with those sets. W1NZR could hear KW1I most of the time, but KW1I had trouble hearing W1NZR on the lower-powered sets, so K2WI relayed. K2WI had to reduce sensitivity to keep from being overloaded by W1NZR, especially when Brown was running the GRC-19, when it was also found necessary to detune the antenna trimmer on the TBX. Operating with reduced sensitivity caused K2WI to miss KA1GON calling from across the Bay. Charlie(KA1GON) ran a TCS set on battery power with a dynamotor power supply. Once Charlie got Dale's attention on another band, we turned up the sensitivity and heard him well. Apparently he had some difficulty loading into a dipole at 20 feet with a series capacitor, but in the end he worked all stations. Contact was established from K2WI to both end stations when they were using BC-611 handhelds. In both cases, the BC-611s were crystalled for 3885 and it was found unnecessary for K2WI to tune the TBX from 3875 to be heard, the handhelds were broad enough to hear us. W2ILA was heard from Gooseberry Neck in between transmissions by distant stations on 3885. When Dale transmitted on his BC-611, 3885 was fairly quiet so copy was about 80 percent. These results were quite surprising. The K2WI group was able to identify the KA1GON location visually with radio towers and buildings as landmarks. Charlie had the very good idea of deploying smoke to mark his location, but unfortunately the stiff breeze kept the smoke low to the ground so it was not visible from West Island. Charlie was able to see the satellite dish at Round Hill Point but had a hard time spotting the WWII fire control tower on West Island. The tower is only about 40 feet tall and may not create a silhouette against the sky, but may rather have land for a background. Access to the tower at West Island was unfeasible due to a 1/4-inch steel plate bolted over the doorway. It would be an ideal place for visual signalling. A possible challenge to signalling from West Island to the LST as it goes though the Bay, is that the sun may be behind West Island when the ship passes. All stations except K2WI were equipped with 50Mc radios and contact was made with PRC-25 (KA1GON) and PRC-77 (KW1I, W1NZR) sets. 30 miles is a good haul for a low-powered backpack set! The day after the exercise, I redeployed the TBX on the beach at Sconticut Neck with help from my nephew, who was celebrating his 4th birthday that day, and my 2-year-old son. My nephew screwed all the antenna sections together and pounded in the guy stakes with a 1-pound hammer. My son pulled out the guy cords and also took a go with the hammer. These little guys are doing very well as Radioman Strikers and will make RM3 in no time. Once I set up the rest of the set, I experimented with counterpoises. With a single 30-foot counterpoise, antenna current was hard to read. Adding a 60-foot one brought the maximum antenna current up to .2A. Using that 60-foot wire as two 30-foot radials, for a total of 3, brought maximum antenna current up to .4A. K2WI was heard at check-in on the OMRN that night, missed on the first round when another net was running nearby, and then heard by at least some on the second and final round, with the usual, "All stations 5/5 except K2WI" reports. I looked at the Big Dipper through my antenna while I worked the net. 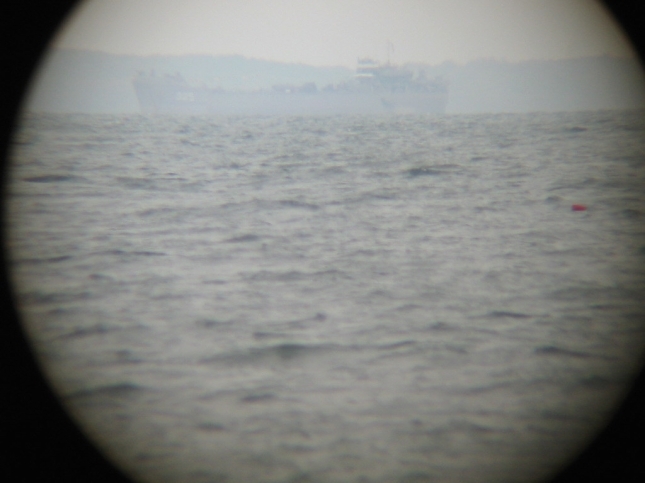 I look forward to trying a 15-mile path over land some day, and to working the LST in June. This map shows the coastwatcher network as planned for our practice exercise. AJ1G was not able to make it due to contingency. When we greeted the LST in June, W1NZR was at Battleship Cove in Fall River, MA, operating from USS Massachusetts and USS Lionfish. AJ1G joined K2WI on West Island, as did KW1I, who later moved up to Mass Maritme.